Click on the bars below to all the subdivisions and condo & townhome complexes in Franktown. You can also view the most popular searches such as ranch style homes, new construction, homes with a pool or houses with mountain views. Click to see Local Subdivision and Complex Maps. What is Your Franktown Home Worth? Franktown is a modestly populated town sitting at the intersection of the Colorado State Highways 86 and 83 west of Elizabeth and Kiowa. Noted for its historical significance to Douglas County and Colorado as a whole, Franktown has remained an important location despite its humble size. Visitors and homeowners are attracted to the town because of its potent blend of sought-after community spirit, splendid home choices, and access to the rugged outdoors. With a town population of under 400, Franktown, CO is also notable for its strong security record, allowing families to feel safe in the various subdivisions that surround the town. Children who live in Franktown are part of the Douglas RE-1 School District and will attend Franktown Elementary, Sagewood Middle, and Ponderosa High. Franktown has become a sought-after location for homeowners, and developers have delivered with some fantastic communities with a good choice of properties. Meadows at Castlewood provide owners with the added security of a gated community, while the homes stand out with their high-end luxury. Two Bridges is a new subdivision that provides opulent homes for residents that are modern and spacious. Living an affluent life in Colorado is often about connecting with the outdoors with large plots of land. 5+ acre plots are available at Deerfield, Russellville, and Bannockburn, each offering horse-friendly zoning and ranch-style homes. While there are no complexes or condos in Franktown, affordable living is available within the charming communities of Flintwood Hills and Whispering Pines. Over 150 years ago, Franktown served as the first seat of Douglas County. Despite not being the seat for 15 decades since, Franktown has retained its significance in the history of both Douglas County and Colorado. As such, the Franktown museum is a tiny but interesting place that charts the town through the generations. Sites of historical significance are frequent in Franktown, CO, not least the Pike’s Peak Grange Hall No. 163, which is listed on the National Register of Historical Places. Rock Ridge Ranch Barn is another noteworthy historical building, an 1880’s structure that is a rare surviving example of pegged, post and beam construction. When you’ve finished enjoying a walk-through history, Franktown can provide an excellent example of small-town Colorado. Embracing modern amenities without trading its historic frontier town roots, residents have plenty to do in terms of dining, retail, and entertainment. Franktown also encapsulates Colorado’s outdoor spirit at Castlewood Canyon, an adventurer’s wonderland that attracts visitors for hiking, walking, horse riding, rock climbing, and more. 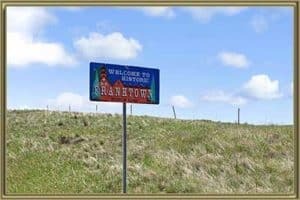 Small but rich with history, Franktown, CO provides an excellent array of home choices while giving residents a true frontier style community spirit to become a part of. It’s no surprise that Franktown has become a very popular choice for homeowners wanting a quieter life while connecting with the outdoors. See all the Things to do in Franktown, CO.
Buying or selling a home can be a daunting task, which is why the team at Gold Compass Real Estate is on hand to provide our expert advice. When selling a property in Franktown, we can provide advice on the current market trends and arrange viewings, consultations, and more. Check out your Franktown Home Value Instantly Online now to know more about selling your home in the area. Gold Compass Real Estate is an expert on buying homes in Franktown, Douglas County, and Colorado as a whole. We provide you with the tools and confidence to find your dream home in Franktown, CO. Our expert agents are fully qualified and, moreover, are knowledgeable of the local market, which allows us to advise you on market conditions such as prices and subdivisions. For more information, please take our complementary Free Personalized Market Report, which helps you understand the local market. To ensure you can find the best property to meet your needs, we regularly update our online database to reflect new listings, changes, and prices. For more information, call Gold Compass Real Estate at 303-325-5690 to discuss buying or selling property in Franktown, Colorado.